Picking up where Leo left off, CB has gone above and beyond those Fullerton designs of yesteryear. All standard Speedsters feature a 25.5" scale and one-piece bolt-on neck with "paintbrush" headstock. #15-66. One piece solid ash, transparent orange finish. The TV Jones T-Armond single coil pickups are amazing on this guitar. They sound fatter than a Tele, thinner than a P-90, with tons of warm growl and spit when needed. The MOTS pickguard just sparkles! This is CB's ode to the rockabilly Gretsch guitars of yesteryear. Growl and spank without the hollowbody fog. The TV Jones bridge is a model of good design. Fit & finish are superb and feel & function are simply perfect. The highly figured ash creates some beautiful waves of grain. The mirror polish on the nitro finish makes for some fine reflections! The depth of color creates some amazing shading all by itself. 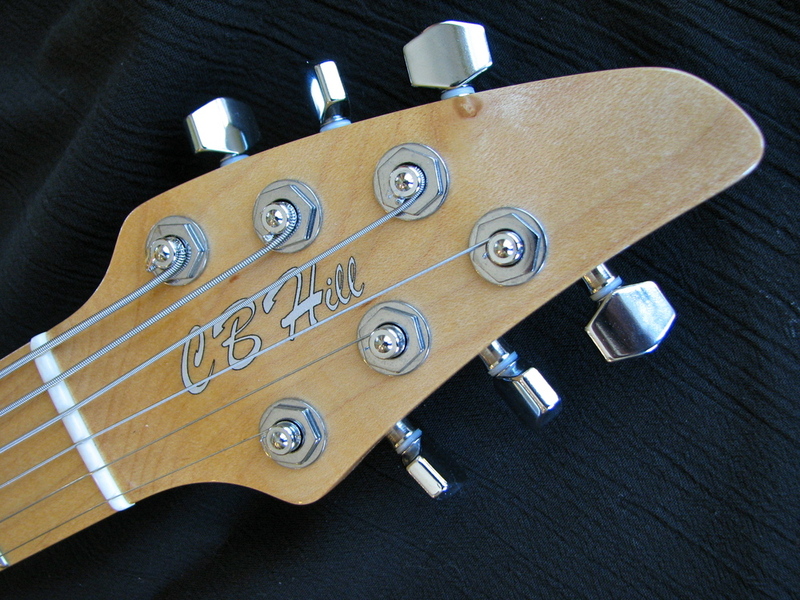 This one features the cresting wave headstock and ivory Sperzel tuner buttons. Gotta love those open geared tuners! and we love the slightly industrial look of the neck pickup! The fit and finish of this guitar are absolutely outstanding – some of CB's best! Gotta love the finish on the backside, Marty Bell did an amazing job on this one! We had to show off how the wood grain flows with the neck shape. 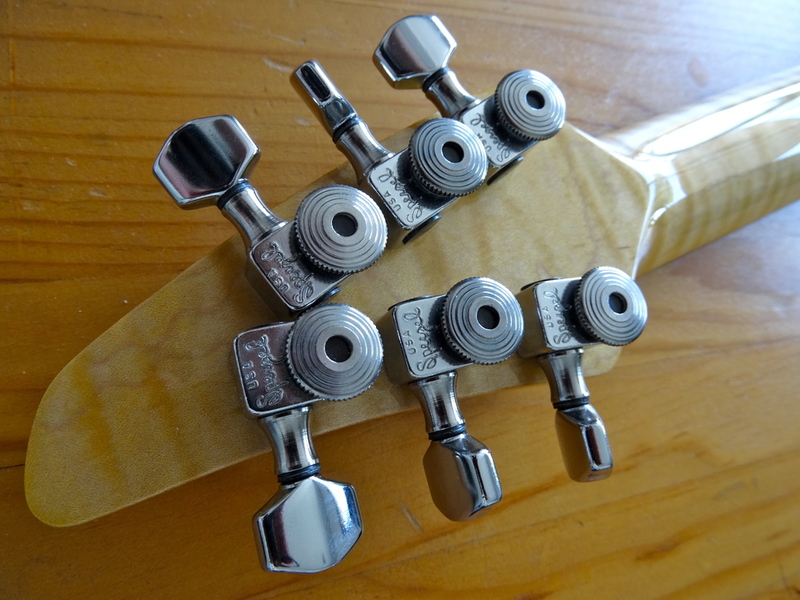 The idea was to create a look that said "old, but cared for"
Offset tuners mean the strings come straight out of the nut for maximum tone. No string trees and no scarf joints to weaken & break! and they're ultra-stable & easy to tune! These are some great-sounding pickups! And dig that crazy one-of-a-kind pickguard! The neck has some great flame to it! The depth of the finish is just amazing! The burst-finish Speedster above is available for purchase from Wildriff Guitars in Canada. The one-piece neck/head is as strong & stable as can be! Thick humbucker tone or single-coil spank at the touch of a button! "The most comfortable heel in the world..."
and no scarf joints to break! The red Speedster above is available for purchase from Wildriff Guitars in Canada. This gives it a very resonant sound & makes it light weight. Super! 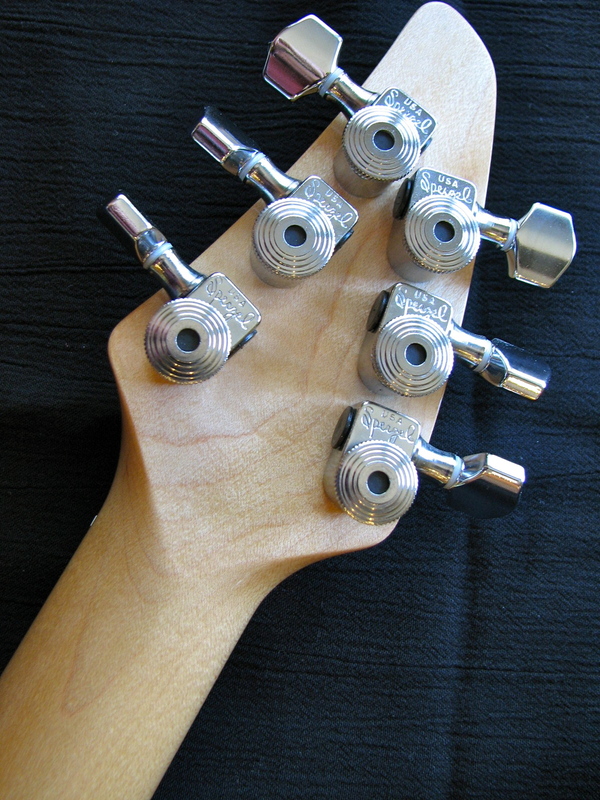 The tone control is also a push/pull switch that turns on the neck pickup when pulled out. This enables every possible pickup combination. The sky blue sparkle finish was done by Marty Bell. Dreamy! The pine Speedster above is available for purchase from Wildriff Guitars in Canada. Out-of-phase brings on the squonk! Those TV Jones Tele bridges are just amazing! The elbow cut on this one came out so elegant! ...and so much depth to the sparkle! The pickups are Tom Short's "Swing'n Singles"
SO much depth in Marty Bell's teal sparkle finish! About as "Strat" as CB can get! Look at the flame in that neck!